The earliest beginnings of such methods date back in 16th century in Colonial America. The Englishmen began to recruit women to come to the colony and become wives. The recruiters even assured the women they would not be wed against their own will and were promised wealthy husbands. The said women, of course, were all chosen because they were believed to become wonderful brides. They were put up for auction as they arrived in Jamestown, and sold in exchange for a hundred and twenty pounds of tobacco. They were then referred to as “Tobacco Brides”. The French conquerors also followed the same method in their colonies in Canada and Louisiana. In Quebec, 800 filles du roi were sent by the French government. In Louisiana, they first sent delinquent women such as prostitutes and petty thieves, and ended up being blamed for increasing the most disreputable practices in New Orleans. The practice of mail order brides was continued throughout the colonial period and into the early republic, often informal. The first use of the phrase “Mail Order Bride” in the media was in the mid-19th century, in 1929 to be precise, seen in the New York Times. The earliest publication found with the phrase was in 1903. In the Old West, men came up with a new way in meeting women from a long distance by writing out to friends and family asking for recommendations of probable women to marry. Those recommended women would then travel to the willing men, if and when they decided to marry. Since then, women were encouraged to start a new life and family, somewhere new with their husband. 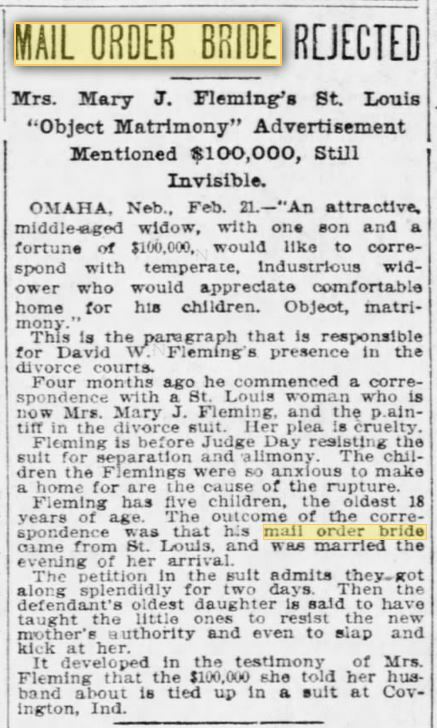 This led to men advertising themselves in newspapers, searching for brides-to-be. Most women responding to the ads were either unsuccessful in finding quality men in their general area and wanted to find someone farther away, or some of them wanted to run off from home due to bad living arrangements or environment. Many old west marriages were formed by this method. In most cases, marriages continued smoothly because both parts represented themselves accurately in their ads. After the first world war and the strict immigration restrictions of the mail order bride, the business died a natural death in the 1970’s. Then it slowly started again helping American men find Asian wives, initially Filipinas. It remained a small business until 1991. Later in the 20th century, mail order brides came as far as having them featured in catalogs and men would be free to choose women to meet and marry from anywhere in the world. From modest beginnings, “Mail Order Brides” has come to a more simple and convenient way of getting results. Mankind has come a long way since the origin and technology has made both life and finding love simpler. There are thousands of International dating services and matchmaking sites all over the web. Technology has broadened the horizons of finding someone you are compatible with and even quicker than it used to be. And it’s not necessarily narrowed down to merely dating or matchmaking services. People are also known to create ties on social media outlets and such. Now, it is easier to get a message from someone who qualifies your standards. You get more information and more details or qualities of that person, such as pictures. Technology is improving everyday so who knows what to expect later on in the century.